Megan is already well known on Instagram with her 36K following but only recently created her blog MeganCawe. Despite only existing since April the fashion blogger has already made an impact with brands collaborating with her and constant invites to press days. Keep an eye on this one, she's going to be big! 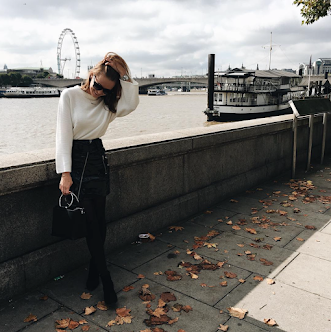 Megan Cawe, Fashion Blogger at MeganCawe and Student. I'd describe my style as very 60s, girly, affordable and sophisticated. I have so many influences on my style; Alexa Chung, Kate Moss, Suki Waterhouse and Pixie Lot to name a few. Your wardrobe is burning - what item do you save? I would save my Topshop Leather Jacket. It goes with everything and its an investment piece. I wish I was brave enough to clash patterns. I've seen so many girls nail this look and there are gorgeous patterned pieces from places like Zara, but I can't bring myself to do it. I am currently using my River Island pastel pink bag. Its quite small so there's not much in it. I have my Ted Baker purse, my iPhone, chewing gum, L'Oreal Paris Lipstick, sunglasses and plasters. A Co-ord from My Bandage Dress and Heels from Bank. Keep experimenting with trends and find a style that you feel comfortable in. I think my style will always be quite girly. I love pastel colours, always have done, so I think this trend will stay. As I get older I'll introduce a lot more monochrome and structured looks. But as I'm still young I'm just experimenting.